Photos of the day: Congo pedicle, where is the K270 billion released by RB? 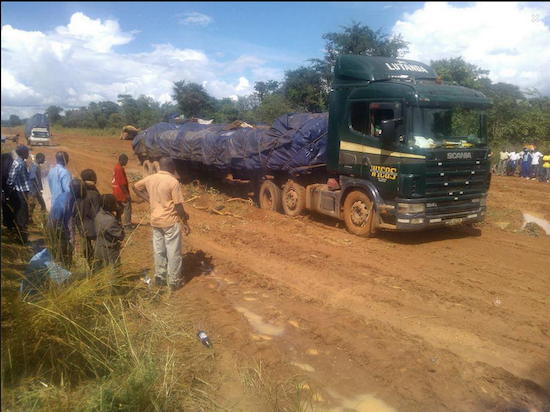 This is how bad the Congo Pedicle Road is as of March 16, 2014. Trucks and busses get stuck in the mud and have to be tolled away. Crime is rampant along the way as cars can easily be forced to stop by criminals hiding in the bush. It takes six days to cross this short distance (about 70 kms) due to the bad road. Yet we know that on May 11, 2011, the MMD Government released K270 billion for tarring the Pedicle Road. So where is this money, because as can be seen here, this road is not tarred? Probably someone is sitting on this money so that when we have forgotten that it was released by RB, that person can post a lie on his Facebook that he has tarred the road? The Congo Pedicle road crosses the Congolese territory in the DRC and was constructed by and is maintained by Zambia to connect Copperbelt and Luapula provinces.